Last time I wrote about a conversation I had with David Hall about recognizing the cost of raising a heifer calf. She will have to throw her fourth calf at age 6 to pay for her own development. This is no small feat as heifers are still growing themselves and gaining molars…without which, it’s hard to fully chew their cud. That first calf is hard on a heifer as she has to provide milk for a growing calf while retaining/regaining condition so she cycles in time for her next pregnancy within a defined breeding window. Without those molars, she faces an up-hill battle. Now, I have heard Kit Pharo toss this around a little bit suggesting if we’re ever going to forgive a cow for coming up open it’s when she’s due for a second calf…but he hasn’t done that in practice, he just suggested it might pencil out. David started his presentation in February by showing a table of relative values comparing a business based on yearling sales to a feedlot. According to the chart (which I believe was cited to a research company and I’m unwilling to republish), reproduction is 10x more important than carcass quality for yearling sales. If you are in the business of selling calves, you have to have calves to sell. The detail below should help us find stock that will work for us, delivering and weaning a calf year after year but keep in mind, fertility is the top priority. So let’s look at the criteria in detail, though I think you’ll find the details overlap considerably. 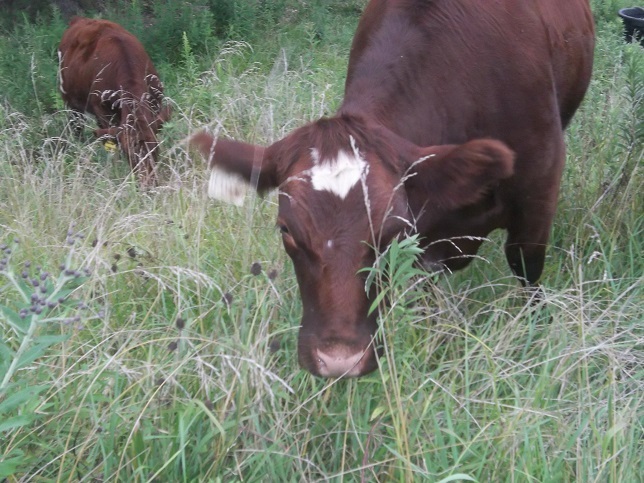 “Be sure to breed to bulls who have a proven record on fescue. Get a bull that is well adapted to your environment.” If I have 25 cows and one bull, that bull makes up half of the genetic makeup of the next generation. Picking the right bull matters and the consequences of a poor choice will impact the operation for years to come. For example, I want a bull that is slick-haired as the shaggy cows (Ms. White) don’t perform as well as the slick cows (#111) on hot days in July. Even better were the Jerseys who got slick in April or May in spite of cool weather and continue grazing when the heat index is above 100. I feel that it is important to select within my herd for shorthorn genetics that are still out working alongside of the Jerseys. Those Jerseys are the benchmark. I have a couple of cows I can usually count on to be out there working on a hot day so I’ll tend to favor their offspring in the coming years. If I pick a bull that throws heavy birth weight calves, I’m breeding heavy birth weight into my herd. I don’t want to spend my spring camping out with the herd and pulling calves. I want to sleep in my soft, comfy bed, get up early and head out to the pasture with a camera to take a picture of the new, live calf on the ground…a calf that was born without any interference from me. If I am selecting for cows that bring a live calf in for weaning each year I have to be careful to do my part by stacking the deck in their favor. Finally, he points out that “there is a strong relationship between age of puberty and longevity.” Cows that are late to mature don’t tend to last in the herd. As we looked at last time, “Cows must be 6 years old and rear 4 calves to pay for her development costs. Optimal economic return is in years 8-11 for commercial cow/calf operations.” So a 6 year-old cow has broken even. I need more than 4 calves out of her to make money. If she misses throwing a calf within a defined window she gets fired. If her attitude is poor she gets fired. If I have to pull a calf, she probably gets fired. The odds are against 90% of the cattle in North America but without this culling we’ll go broke pampering our tea cup cattle and servicing the equipment required to pamper them. That means a short, slick 14 year old cow with a good attitude has thrown 12 calves, year after year eating whatever there is to eat on my farm, with a little bite of salt and mineral. Any cow that can do this has just the genetics we’re looking for in our future herd and continues to impact our herd genetics positively over time. Any cow that can’t will be fired before she makes much of a genetic contribution to the herd. Any bull I select for my own use MUST come from a older cows as that predisposes future generations for success. I just touched on this but if she is fertile and long-lasting she obviously doesn’t demand much from me. I need thrifty cows. Because much of my forage base is fescue, I’m looking for short, barrel-shaped, light-weight cows. Hall said 70% of a cow’s feed is used to maintain condition. A 1,700 pound cow has to eat much more feed to maintain condition than does a 1,000 pound cow. There are only so many hours in a day. How many pounds of forage can a cow ingest and ruminate on each day? To be direct, a heifer that is weaned above 600 pounds won’t last. The cards are stacked against the big cow in a forage-based operation. 111 stays fat no matter what. Notice how wide her mouth…it’s as wide as her eyes. Maybe wider. So where do you find these cows? I wish I knew. You need to pick a bull based on his mother and her production numbers. How many calves has she thrown. How big were the calves? How big is the mother? How old is she? When looking for heifers from within our herd or when buying outside, look for calves that weaned below 500 pounds. We’re looking for a 4-5 frame score. Again, big cows have to eat more to maintain condition. Small cows are hard to market. I could probably run 2-3 Dexter cows per acre on my farm but what feedlot wants to finish out Dexters? I have to find the middle ground between what the market demands and what is profitable to produce. They can’t be too big, they can’t be too small. Hall says to sell the extremes. Hall also pointed out that crossbred cattle tend to have better longevity. That’s something to consider when buying stock. Over time there are things you are watching for in your herd. Cows should be feminine but we’re looking for function, not beauty. A cow with a rough hair coat should find work elsewhere (I have a couple of these). A cow with bad feet or a bad udder should go down the road. Too big or too small? No calf this year? Poor attitude? Prolapse? Down the road. This kind of selection doesn’t require much of the manager. It comes back to the three O’s (which are really two O’s); Old, Open or Ornery. The old cow will eventually come up open, weather from loss of teeth, bad joints or whatever. The selection process is hard on herd numbers early on but success breeds success…literally. In a few years…decades maybe – a picture of our cows will feature less leg than this one both from change in genetics and prenatal response to conditions and management. Really. In part 3 we’ll go a little more in-depth on ideas David has for making the operation profitable and ways to smooth out the highs and lows of the cattle market. 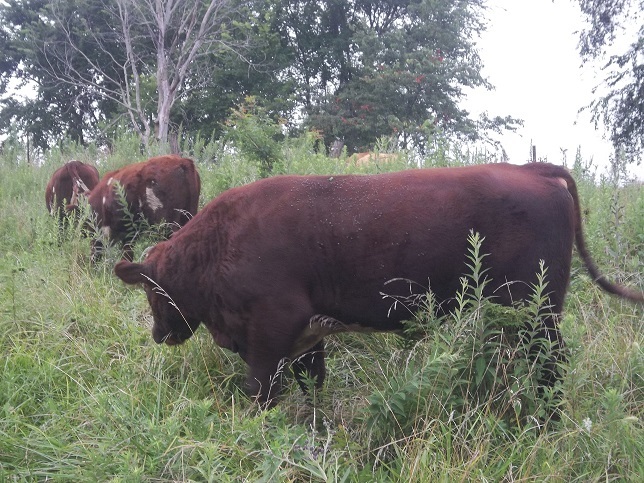 This entry was posted in Cattle, Pasture Management and tagged Grass Genetic Cattle, Grazing Heifers, Ozark Hills Genetics. Bookmark the permalink. Great info here about traits to cull for. David Hall is clearly a goldmine of information. I was doing fine till I hit the paragraph on where to find such great cows. Is the feedlot going to be your primary market for your cattle? If you were planning to finish them out yourself, would Dexters be a better choice? And you said you have to find the middle ground, yet Hall says to sell to the extremes? Can you elaborate a bit there? And is there a good reference to learn about frame scores? I’ve seen them referred to a couple of times. Ah, Dexters. I could pack more beef and milk per acre with a Dexter than with any other breed and they tend to be thrifty cattle. But what do I do with the calves? They are tender, yes. They are flavorful…heck, it’s beef! How many can I, personally, direct retail? I don’t know. Maybe thousands. Maybe. But shooting for the middle ground between great grass performance and “right” sized steaks for packers means I am not under pressure to sell every beef directly. I have to aim for that medium size. The commodity market can soak up my excess and I can focus on what I do best…growing grass. I don’t mean to appear pessimistic about my beef retailing ability. There are only so many hours in a day and if I’m going to do any one thing well it comes at the cost of something else. Time I spend learning to graze (and working off farm) comes at the expense of sales. This is tending back toward my budgeting series. I should post more on that topic. I don’t want a 2,000 pound heifer. She’ll never last. A 200 pound heifer in a herd of 1,000 pound cows would run into problems of her own. 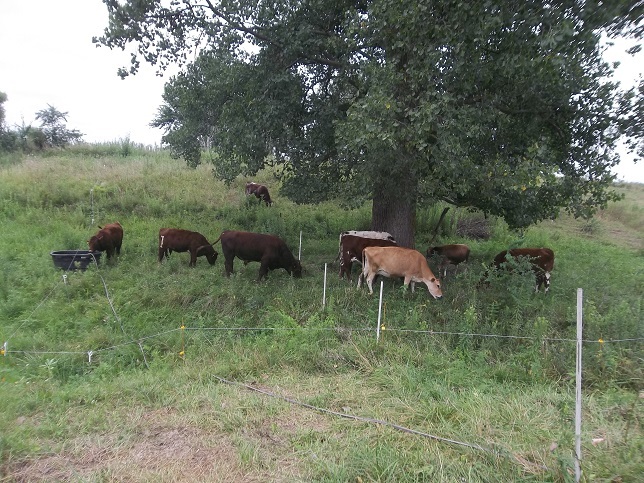 Using nearby grazers as a source of guidance, 1,000-1,200 pound cows are going to be the best performing animals I can raise on grass while preserving the carcass qualities demanded by packers…and by customers. What size brisket are you accustomed to buying? If I make one that is too big or too small I’ll have to hustle to market it. We’re shooting for a certain size of cow. Too big, she won’t breed. Too small, we can’t sell her. I feel like Goldilocks. We need the cow that is just right. Thanks for the great info. I should have waited with my questions last post, as many were answered this time. I’m curious about the Dexters and elevation. I’m thinking of grazing/raising the cattle at 2500 feet. Would a smaller cow fair better? First, don’t wait to ask questions I may never answer. I count on you guys to get more out of me. As an example, SailorsSmallFarm finds ways of looking at things I hadn’t considered and that’s an especially valuable part of the collaborative learning going on here. Ask away. I assume you are concerned with brisket disease but 2500 feet shouldn’t be much of a deal…especially if you’re buying stock from nearby. Kit Pharo has sales specifically for high-elevation cattle but those are from 5,000 feet. Maybe I need you to specify what “fare better” means. If you have quality, rested forage, access to water and a little bit of mineral and salt…well, what more could a cow ask for? I wrote about 3 more pages of response but decided it would be better as a whole post. And that’s why I need you to make comments, Steve. Thanks.